The easiest way to make healthy meals at home is to make one-pot bowls like this one that is full of flavour and healthy nutrients. For any one with allergies, intolerances or special dietary needs, this dish is vegan friendly, gluten-free, dairy-free, nut-free and oh so tasty. Heat coconut oil in a large saucepan over medium heat. Add the spices, cooking for 1 minute to release the flavors. Add the onions, garlic and broccoli, cooking for approximately 3 minutes to soften the broccoli. Stir in the lentils, lime zest and juice and stir to combine. Add the stock, cover, and bring to a boil. Reduce the heat to medium-low and let simmer for 20-30 minutes, or until lentils are soft. Stir in the cilantro right before serving. 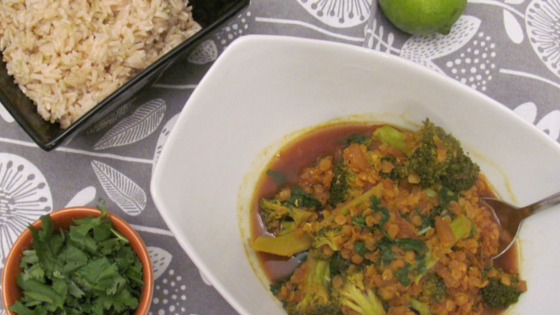 Add ½ cup cooked rice to each bowl and top with red lentil Dahl.